Here at The Magnolia Company, it is important that we stay current with the latest trends and find new inspiring ways to design with our wonderful farm fresh products. Our team not only shops the interior design markets around the globe for the latest color inspirations, but we also display our products in many of these arenas. We love to listen and get the opinions of consumers who walk by our booth at shows. Working far in advance, oftentimes a year in advance, we use our gathered knowledge to forecast trends. As trends change in fashion and interior design, the Magnolia Company will continue to evolve and be your resource for on trend, current, high quality design. Recently, Pantone released the color of the year for 2017 called “Greenery.” This vibrant green has a tinge of yellow, but is by no means considered chartreuse. 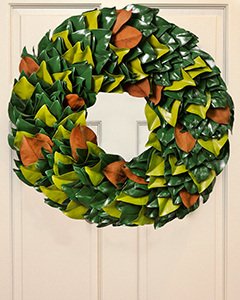 We now have incorporated this color into several of our wreaths. Fresh and alive, this color evokes a beauty we see in nature: from new grass to the unfurling of spring leaves. Our team pondered greatly over this color and after several experiments and testing we all finally agreed on the shade selected to bring this color trend to you. In addition in 2017, we are seeing several teals and soft, muted tones gaining popularity, along with the beloved classic blue. This spring, we are proud to have launched several new products in these colors. 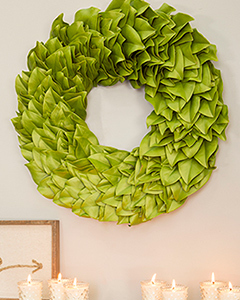 Consumers have already made these the best sellers of the season for gifting and home decor. We pride ourselves on quality at The Magnolia Company, knowing that each piece is uniquely designed, with each item hand crafted in the USA by our floral artists.